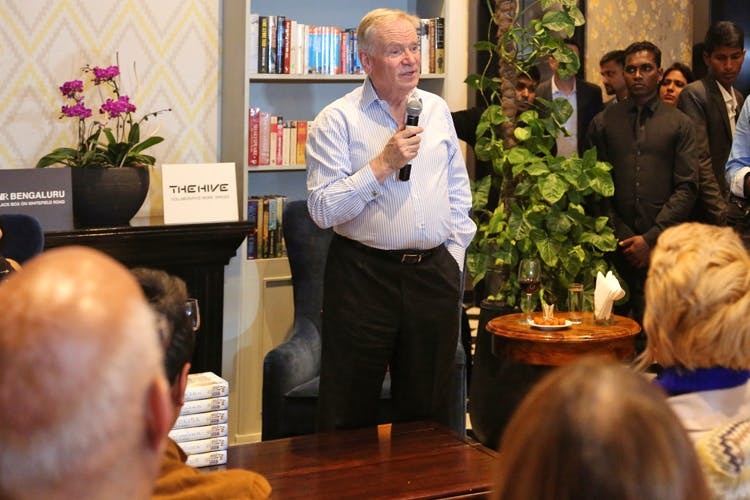 In town for the launch of his latest book — This Was A Man —Jeffrey Archer shares his literature favourites and the secret behind his stupendous success as a writer. On a quick, four-day India tour, Jeffrey Archer is unveiling his latest offering — This Was A Man. The seventh and concluding novel in his now famous Clifton Chronicles, This Was A Man has already been embraced by critics and readers alike. This obviously is not the first time Archer has earned high accolades. A regular feature on the bestsellers’ list, Archer has sold over 330 million copies of his novels through the years. This Was A Man has brought Archer to Bangalore for the second time. He was here previously in 2011 to launch the first book of the Clifton Chronicles — Only Time Will Tell. We met him at The Waverly Hotel & Residences at VR Bengaluru. Ask him what brings him back and he proudly whips out his phone to show us a picture that was taken earlier that morning. In the picture, he’s standing on stage, his back to a packed auditorium in Christ University. This is why he’s back, he tells us. Sitting in a suite at The Waverly Hotel & Residences, Archer reveals that in his two visits here, he hasn’t managed to see much of the city. Except, of course, for the “two-three hour car rides” he’s had to endure. But there’s one crucial detail that hasn’t been lost on him. “The women here are very smartly dressed,” he says. On this tour, Archer has on many platforms expressed his love for RK Narayan’s work. And he reiterates his affection for the author in our catch-up too. And counts Narayan’s writings along with Stefan Zweig’s Beware of Pity and Elena Ferrante’s My Brilliant Friend as his all time favourite reads.